Udupi, Jan 12, 2019: Health officials are leaving no stone unturned to control the spread of the Kyasanur Forest Disease or monkey fever, but dead monkeys continue to be found in the forests of Malnad region, causing concern among the people. Three new KFD cases were reported at Aralagodu gram panchayat limits of Sagar taluk coming under the purview of Sharavathy valley wildlife sanctuary on Thursday. They are undergoing treatment at KMC Hospital, Manipal. Speaking to DH, district health officer Venkatesh said the medical examination reports had confirmed that Ramamma, a resident of Kanchikai, Aralagodu gram panchayat, died of KFD. With this, the number of KFD deaths rose to five. The report of another patient Krishnappa is awaited. He said 57 KFD cases were reported in the district so far. 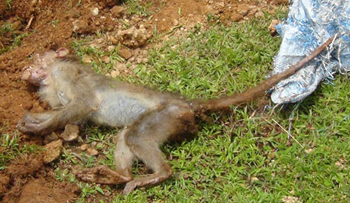 As many as 26 dead monkeys were found and their carcasses were burnt in the forest. A team of experts from Mysuru have initiated a tick collection drive in Sagar and Hosanagar areas. They collected ticks (a type of insects) at Ulavi, Hosabale and other villages of Sorab taluk. Tests will be conducted on the ticks in the laboratory. The carcass of another monkey was discovered at Hirgana village in Karkala taluk, Udupi district on Thursday. had been conducted and samples had been sent to the laboratory in Shivamogga for testing. “The reason behind the sudden death of monkeys will be known next week after the report from the laboratory reaches us next week,” she said. The DHO, allaying apprehensions in villagers, said spraying of insect repellents was taken up in villages lying on the border of forests to prevent infected ticks from spreading the monkey disease. Among the 59 patients admitted in KMC hospital in Manipal, 21 had tested positive to KFD. All the 59 patients hail from Shivamogga district. Four patients had been shifted to the intensive care unit and 33 patients are recovering, sources said. Special care has to be taken to avoid the monkeys from being dead.